PSHE covered in Form Time and approx. 6 Focus days each year. KS3 complete at end of Y8. Y9 Start full GCSE in Maths, English, Science and RS. Start Foundation GCSE in IT/Computing, Technology, History, Geography, Music, Art and MFL (2 languages) – in preparation for Option choices in Y10. Science. Triple Science is offered within one Option block. 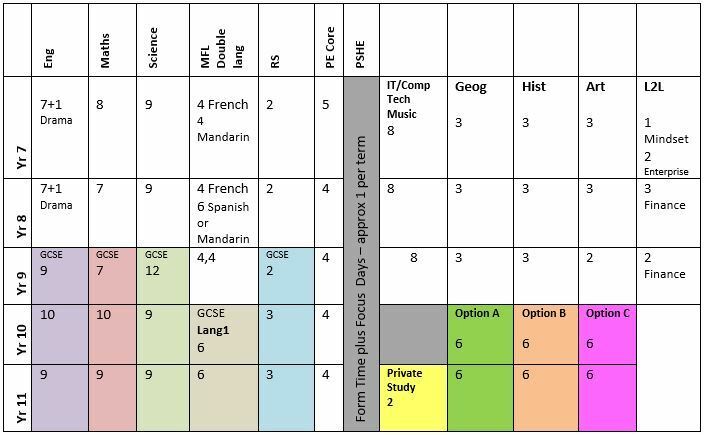 All students start with 12 periods in Y9. Students opting for Triple Science will have 9 periods plus 6 periods within one Option. Double Science continue with 9 periods in Years 10 & 11. IT lessons reduced as a result of national expectations. More time used to cover Computing. All students study two Modern Foreign Languages in Years 7,8 and 9. French and Mandarin are studied in Year 7. Students may choose to drop one of these languages and begin Spanish from Year 8. They continue with at least one language to GCSE level. French is studied by all students in Years 7-9. Mandarin is studied in Year 7. Students may continue to study Mandarin in Years 8 & 9 or change to Spanish from Year 8. Approximately 30 students in each cohort will have the opportunity to join the Mandarin Excellence Programme. This group will have 2 one hour twilight sessions in addition to the normal Mandarin classes plus extra homework, enabling them to immerse themselves in the Chinese culture. They are expected to be at GCSE standard by the end of Y9. During Years 9, 10 and 11 students study both GCSE subjects plus a range of enrichment courses designed to broaden their KS4 experience. In Year 9, students begin their GCSE courses in English, Mathematics, Science and RS and a bridging course from KS3 to KS4 in all other subjects.